In January, Aspyr Media ported "Civilization VI" to the iPad. I eagerly downloaded the app with a healthy dose of skepticism. 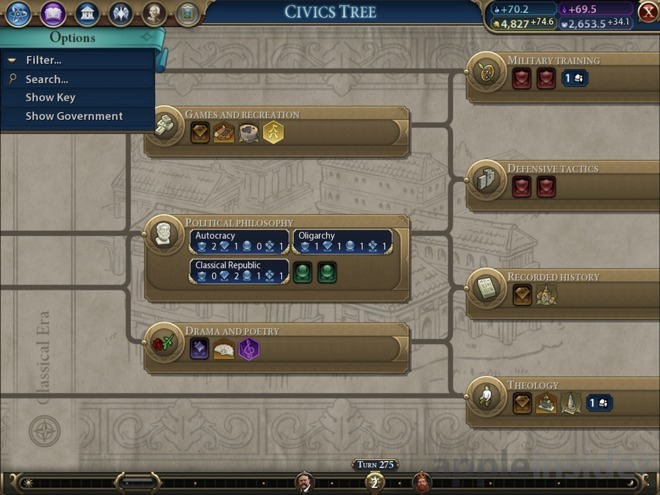 This wasn't one of the early Civ titles, but the most recent. I wholeheartedly expected a watered down version, stripped of key features and mechanisms like we saw with Civilization Revolution. To my surprise, that was not the case. The game, which weighed in at a healthy 3.3 GB, is designed specifically for higher-end iPads, taking full advantage of the touchscreen. As a turn-based strategy game, the menu-laden interface lends itself well to touch, possibly even more so than a mouse. It was easiest for choosing focuses such as production or research, and a little bit less so for moving your characters. It worked but was a bit finicky at first as I adjusted to the interface. There are a couple different gestures to know, such as tapping with multiple fingers to exit an open menu, but along the way, "advisors" will let you know of these and you should catch on pretty quick. Playing I found it to be at times more enjoyable than on my Mac. I could lazily relax on the couch instead of sitting in an uncomfortable office chair at my desk. I appreciated the little touches that they took into consideration, such as the ever-present battery indicator in the top right corner so you don't inadvertently run out of power. It has literally every feature found in the desktop version, up to and including local multiplayer. Instead of LAN parties with everyone on laptops and desktops, they can now be done even more easily right from your iPad. When playing, you can go with several campaigns and pre-designed modes or you can go and create your own custom scenario with every aspect you can think of. "Civilization VI" is not a small game or lightweight game. It requires some serious horsepower to run, which is why only newer iPads are equipped to play it. Any iPad Pro, the iPad Air 2, and the 2017 iPad are all capable, but any older are out of luck. On the Mac side, it takes some pretty serious silicon. So, I was really concerned how the game would run later in a match where turns get much more complex. 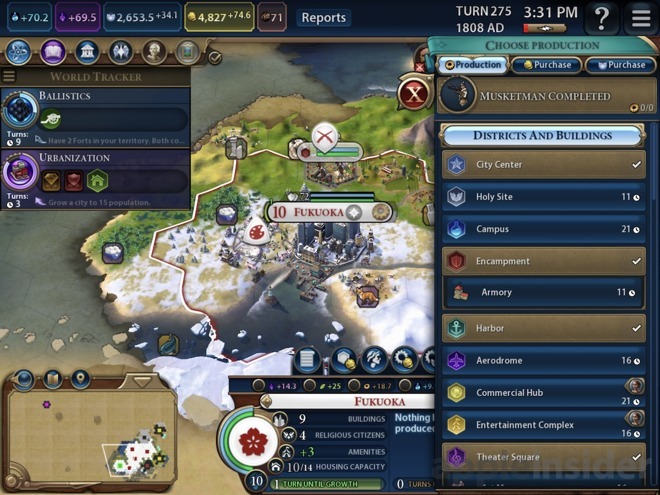 At the onset of a new game, everything is flashy and quick, but as the game progresses, nation's boundaries expand, the number of units balloon, and the AI has much more work to do. Shockingly, even in the end-game, turns were not unnecessarily bogged down. They certainly slowed, but not to the point where it was noticeably over-taxing the iPad. We're not sure we recommend the iPad Air 2 or the fifth generation iPad —but it does run. Any iPad Pro or the 2018 sixth-generation iPad are great experiences. 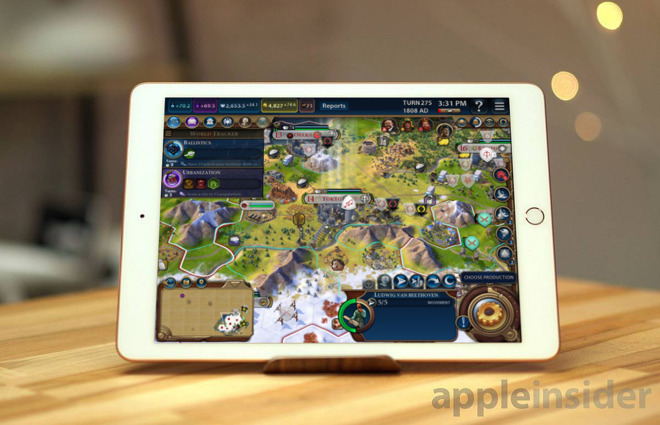 Aspyr Media took a great approach to monetizing "Civilization VI" on iPad. They realize the strengths of the game, and trusted users would pay once they got a taste. Downloading the game is free, as are the first 60 turns. At this point, the full game can be unlocked with a one-time in-app purchase. We can't overstate how much we prefer a single in-app purchase to unlock the full game over coins, energy, loot boxes, or other similar nonsense. Yes, those seem to be earning game devs money hands over fist in titles like "Clash of Clans" or "Candy Crush", but these games are shallow and not even close to the same level as the impeccably done Civilization series. This game has so much to explore, and without endless paywalls or wait times to earn "energy," it can all be played when or where you want. It must have been tempting to put all of the world leaders or maps behind in-app purchases, but we are thrilled that Aspyr Media made the decision not to do so, beyond a handful of optional expansions. Since launch, expansions have landed —including new civilizations —which are behind in-app purchases, but expansions are a different beast than locking them from the get-go. I've said it once, and I'll say it again —this game is worth the price, even at $60. Since January, I've been playing the game and it remains a reliable source of entertainment when I have a few moments to kick back. Expansions continue to add value to the initial purchase for a reasonable fee, keeping me coming back time after time. 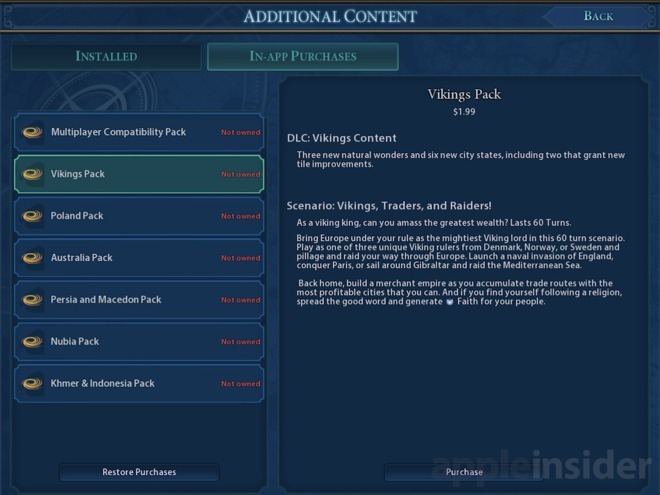 I would love to see more large-scale games like Civilization VI come to the iPad, though the current trend still seems to be so-called free-to-play freemium titles cluttering the App Store.